MAYVILLE — More than two weeks since the Centralized Arraignment Program in Chautauqua County has taken effect, Ellicott Town Justice Marilyn Gerace hosted town justices and other officials from the eighth judicial district during a ribbon-cutting ceremony at the Chautauqua County Sheriff’s Office and county jail. The CAP courtroom sits in the building, providing extra security for justices who would not normally have it at irregular hours at their hometown courts. Arraignments are hosted each day at the courtroom from 8-11 a.m. and 7-10 p.m. Gerace and Eighth Judicial District Administrative Judge Paula Feroleto said justices have already conducted more than 40 arraignments. 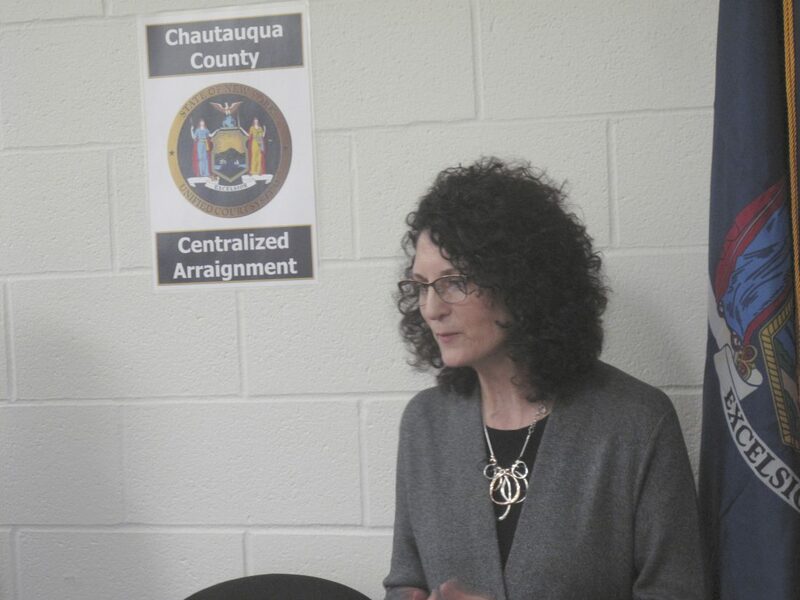 Chautauqua County’s fledgling program is working out its kinks, Gerace said, and she’s optimistic about its future. Another of the primary benefits in a CAP is how defendants can be guaranteed representation by attorneys in a more convenient, centralized location. She said another plus is that defendants won’t have to spend as much time in transit or waiting in police cruisers. A schedule rotates town justices on a calendar that has been written up for all of 2019 so far. Public Defender Ned Barone complimented the cooperative effort of the program, stating that providing counsel is of utmost importance. He said the CAP will also help keep town jail populations down and give town justices a more stable schedule to look forward to. Gerace said she had to handle seven arraignments in one night alone, which she said serves as a prime example of how helpful centralized arraignment can be. All those were arraigned that night were from different municipalities, so having them all in one location sped the process along. Support was given in writing by those who could not attend, including Sheriff Jim Quattrone, County Executive George Borrello and District Attorney Patrick Swanson. Chautauqua County’s CAP is the first to open in the eighth judicial district, something Feroleto said was crucial to show that the district will no longer be lagging behind in the rest of the state in terms of having CAPs. “It’s always hard when you change things,” Feroleto said. She’s hopeful that all departments and courts continue to see the positive changes the CAP provides in the county. Feroleto also hopes that the other seven counties in the district work on implement CAPs.